Why build skin boats? I've been asking myself that ever since I started building skin boats. I've come up with a bunch of practical reasons such as low price but that's not really why I built them. First and foremost I liked the looks of skin boats. But right up there with good looks was also a yearning for self-reliance. I wanted to be able to build a boat that at least in principle I could build entirely from scavenged materials with simple tools that if need be I could make myself. For the sake of convenience, I use electrical tools to cut the wood and synthetic fiber cloth as a skin and petroleum based paint to seal the skin so I don't really build an entirely off the grid boat. 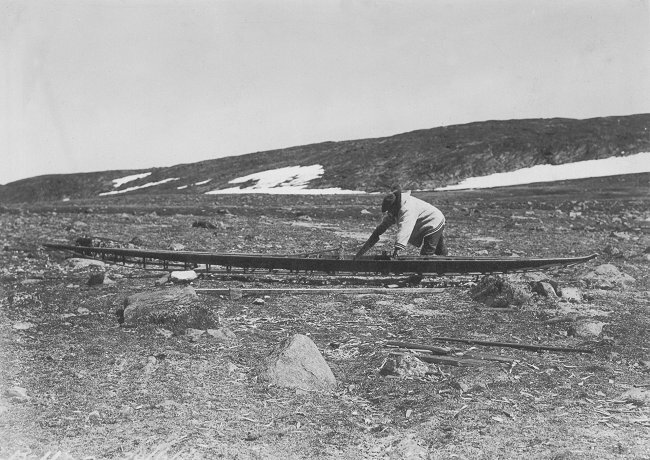 But I like to imagine that I could build a boat strictly from found materials in the manner that people of the Arctic once did. In a way, the Arctic before the arrival of the Europeans was very much like what a post-apocalyptic (PA) world would be like. No stores, no factories, no electricity. Everything you wanted you had to scrounge or barter for. But a PA world would not look exactly like the pre-industrial Arctic. A PA world would have a lot of stuff from the industrial world still laying around like scrap metal, wire, plywood, tar and even ready to use hand-tools. A PA world would not be a stone age world necessarily. It would be a world that had very little new stuff in it. If you wanted new stuff, like a new kayak for instance, you or one of your friends would have to make it themselves. Could I build a boat entirely from scrounged materials in a PA world? Probably. More than likely, if I wanted a boat with some cargo capacity, I would probably scavenge plywood, and make it out of that. I don't know what would be available in the way of sealers to keep the boat from leaking, but I could probably find something. If I wanted to build a skin on frame kayak, that would be fairly easy. Plenty of construction lumber installed in buildings. I am assuming that I could get some hand saws. The hardest thing to find would be a suitable skin. I imagine myself scrounging tarps or awnings and sewing those together, again, assuming I could get a hold of some needles or maybe even make them from bone. If the tarps were plastic, they wouldn't need a sealer. If the tarps were not plastic, I would have to figure out a way to make them waterproof. Hunting sea mammals for skins would be more or less out of the question. That would require more skill than I have. Even if I could manage to kill a sea lion hauled out on a beach by stealth, I would need four skins to cover a kayak. Getting four skins would be way too ambitious. 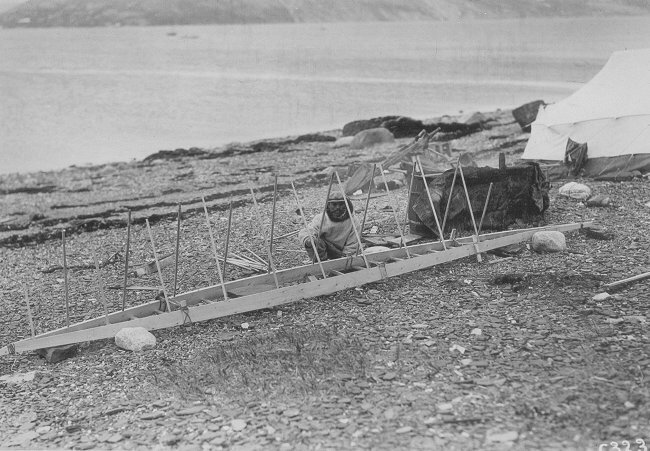 But how exactly did people of the Arctic build their kayaks in a pre-industrial world? We have some ideas but Europeans have been going to the Arctic since the 17th century and most of the kayaks now in museums were built with at least some access to steel tools and also possible to milled lumber. The pictures below show what kayak building looked like in the transitionary period when people in the Arctic still built kayaks, but had industrially sourced tools and materials available to them. The kayak type being built here is Eastern Arctic, that is Canadian Arctic. 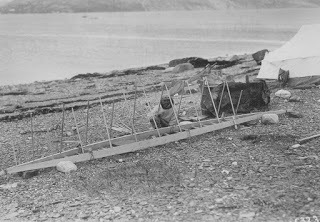 These kayaks were long flat and stable and if you killed a seal, you transported the carcass on the wide back deck of the kayak. Here's a guy in his open air workshop, no special jigs or benches or other sort of stuff you would expect to find in a boat shop. But he does seem to have a handsaw that he is using to trim something in the cockpit area of his kayak. This guy is sitting in his workshop. He's using some rocks to level out the deck of his kayak. He's got the rib blanks stuck into their mortises, all ready for bending and trimming. Or maybe he is going to do three-part ribs with hard corners. Also not the canvas tent in the background. Here two people are working at putting a skin on the finished kayak frame. The skin is canvas, not seal hide so one or two people can do the job. 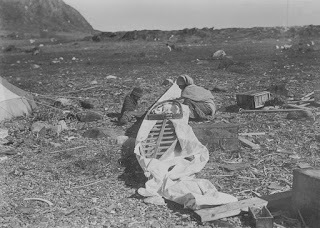 Putting on seal hide usually was a task for many women since the hides had to be kept wet and pieced together which required way more sewing than was practical for one woman to do by herself although it was probably done solo sometimes by necessity. Also not the wood plank in the foreground, evidence of milled lumber brought into this location, probably by ship. Also note the long wide and flat back deck suitable for transporting the spoils of the hunt. So what can we say about boat building in an imaginary PA world? Probably possible as long as nobody has any set ideas about what is allowed in the ways of tools and materials. The Adirondack Guide Boat - too much technology?